Textile Industry - For thermal processes, fiber and dye stuff fixation. fabric drying coating and impregnation of fabrics with plastics, heating of hasp skids also in HT execution. Chemical Industry - Heating of wood processes, wood drying plants, plywood presses. Plastics Industry & Floor Products - Heating of calendars rolls, melting boilers etc. 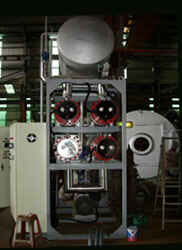 Heating of plastic processes. Die casting automates, also with cooling. 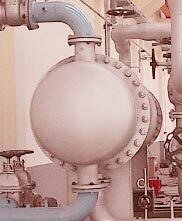 Soap & Wash Power Industry - Heating of autoclaves, vats, continuous specification plants, spray drier for wash power. Bitumen & Tar Processing Industry - Tank farms, cargo handing and mixing facilities. Tankers, tank cars, bitumen and tar supply facilities of construction sites. Paper & Cardboard Industry - Heating of drying cylinder rolls and drying chambers. Electronic Industry - Hot press, coating machine, drying oven, calendar roller. Food Stuffs & Related Industry - Distillation of fatty acid and lysine deodorizing of salad oils, cleavage of fat, boiling vessels. Building Material Industry - Heating of drying chambers, steel planking, silo heating.. etc.